Petey is a quirky, free-spirited little boy-paintbrush that loves color, but can’t choose a favorite. He loves them all too much! Petey sees the world in a rainbow of colors and knows that every color has its place. 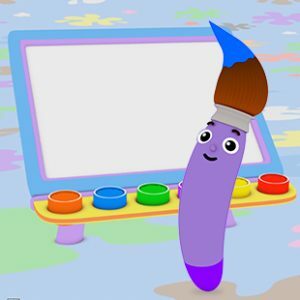 In each episode Petey focuses on one color, paints pretty pictures and help viewers learn the colors of everyday objects and what each color is called. On his palette, Petey paints several items of one color, all while singing his song and having great time! See what time Petey Paintbrush is playing!